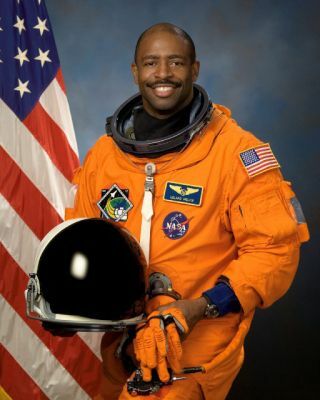 NASA astronaut Leland Melvin poses for a preflight portrait in his launch and entry pressure suit. PERSONALDATA: BornFebruary 15, 1964 in Lynchburg, Virginia. Unmarried. Recreational interestsinclude photography, piano, reading, music, cycling, tennis, and snowboarding.Loves walking his dogs, Jake and Scout. Chosen by the Detroit Lions in the 11thround of the 1986 NFL college draft. Also participated in the Toronto Argonautsand Dallas Cowboys football training camps. His parents Deems and Grace Melvin,reside in Lynchburg, Virginia. EDUCATION: Graduated from Heritage HighSchool, Lynchburg, Virginia, in 1982; received a bachelor of science degree inchemistry from the University of Richmond, Richmond, Virginia in 1986; and amaster of science degree in materials science engineering from the Universityof Virginia in 1991. ORGANIZATIONS: National Technical Association(Hampton Roads Chapter Secretary 1993), American Chemical Society, The Societyfor Experimental Mechanics. SPECIALHONORS/AWARDS:Invention Disclosure Award for Lead Insensitive Fiber Optic Phase Locked LoopSensor, NASA Outstanding Performance Awards (8), NASA Superior AccomplishmentAward (2), Key to the City of Lynchburg, Virginia, NCAA Division I Academic AllAmerican, University of Richmond Athletic Hall of Fame Inductee. NASAEXPERIENCE:Mr. Melvin began working in the Fiber Optic Sensors group of the NondestructiveEvaluation Sciences Branch at NASA Langley Research Center in 1989 where heconducted research in the area of physical measurements for the development ofadvanced instrumentation for Nondestructive Evaluation (NDE). Hisresponsibilities included using optical fiber sensors to measure strain,temperature, and chemical damage in both composite and metallic structures.Additional projects included developing optical interferometric techniques forquantitative determination of damage in aerospace structures and materials. In1994, Mr. Melvin was selected to lead the Vehicle Health Monitoring (VHM) teamfor the cooperative Lockheed/NASA X-33 Reusable Launch Vehicle (RLV) program. The teamdeveloped distributed fiber optic strain, temperature and hydrogen sensors forthe reduction of vehicle operational costs and to monitor composite liquidoxygen tank and cryogenic insulation performance. In 1996, Mr. Melvin co-designedand monitored construction of an optical NDE facility capable of producingin-line fiber optic Bragg grating strain sensors at rates in excess of 1000 perhour. This facility will provide a means for performing advanced sensor andlaser research for development of aerospace and civil health monitoringsystems. Selected byNASA JSC in June 1998, Mr. Melvin reported for training in August 1998.Astronaut Candidate Training included orientation briefings and tours, numerousscientific and technical briefings, intensive instruction in Shuttle andInternational Space Station systems, physiological training and ground schoolto prepare for T-38 flight training, as well as learning water and wildernesssurvival techniques. Since thenhe has been assigned to the Astronaut Office Space Station Operations Branch,and the Education Department at NASA Headquarters, Washington, D.C. Asco-manager of NASA's Educator Astronaut Program, Leland Melvin traveled acrossthe country, engaging thousands of students and teachers in the excitement ofspace exploration, and inspiring them to pursue careers in science, technology,engineering and mathematics. He next served in the Robotics Branch of theAstronaut Office. Mr. Melvin is assignedto the STS-122 mission that will deliver the European Space Agency?sColumbus Laboratory to the International Space Station.